Round 2 of the NHL Playoffs was filled with sweat, blood, and tears. As suggested by the Model, we saw a couple of game 7s, one of which saw Alexander Ovechkin and the Washington Capitals fall victim to the Sidney Crosby-led Pittsburgh Penguins (or should I say the Jake Guentzel led Pittsburgh Penguins). 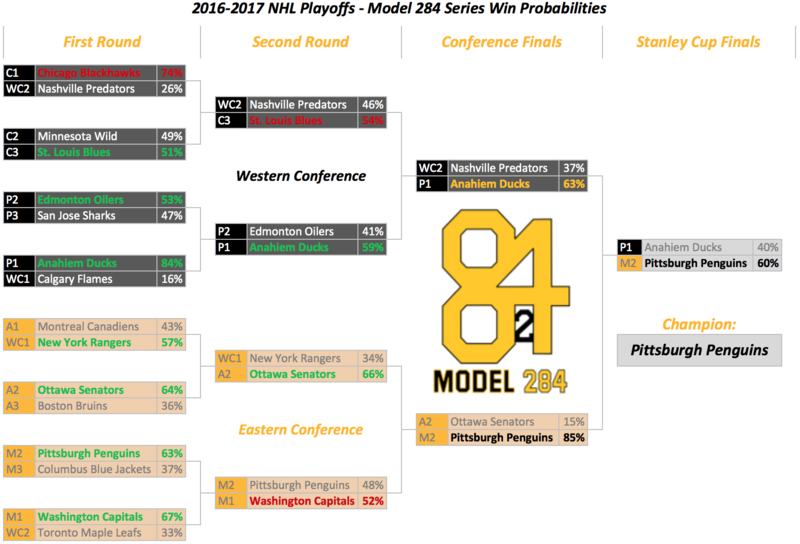 Anyway, the Model went 2 for 4 in round 2 predictions, although the Capitals-Penguins series was pretty much 50-50, and the Model actually had the Penguins with a better chance of winning the cup than the Capitals. The Predators continued to outsmart the Model by dismantling the Blues in 6. It is now conceivable that the Model may not be properly capturing the true ability of the Predators. We will put that theory to the test once again as the Predators remain underdogs against the Ducks, from the Model’s point of view. Below is our updated playoff bracket. Again, we build our bracket by advancing the team with the higher win probability for each series. The probabilities are generated from the average of our NHL playoff models, which use team-level and individual player statistics to predict the probability that a team will win a given series. For more information on the Methodology behind the NHL Playoff Model, see here. From this point on, we have the Penguins as heavy favorites over the Senators, and the Ducks over the Predators. The following table displays the outcomes of 10,000 simulations from the conference Finals and on. It looks like the Penguins are overwhelming favorites to once again become Stanley Cup Champions. I can’t say I am surprised, with workout warrior Phil Kessel and tough guy Jake Guentzel, the Penguins are built to be Stanley Cup Champions.